Do they have a good reputation? Talk to other brides. Look online for reviews. The more you know about them the more at ease you will be to leave your precious gown with them. Will they spend time explaining the process? A good cleaner will be able to share the details of the cleaning process. They will examine your gown before cleaning and point out any problems they see and tell you how they can handle them. They will let you see the gown at different stages of the cleaning if that is what you want. Make sure that your gown is cleaned where you have taken your gown! You want to be sure that your gown is cleaned in house. If you take your gown somewhere and it is then sent out the place you are leaving your gown is saying they are not equipped to do the cleaning. Don’t be afraid to ask questions this is your gown….. you have every right to know how it will be taken care of. 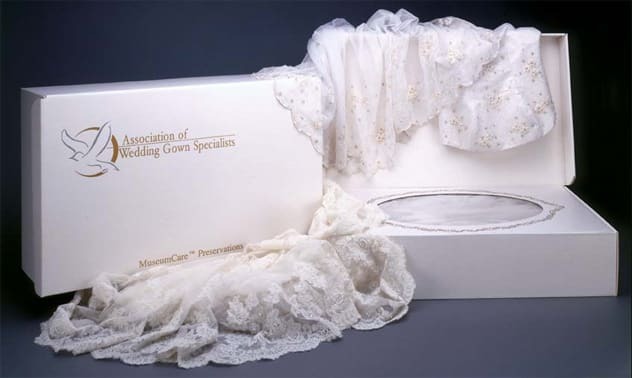 We are a seated board member of the Association of Wedding Gown Specialists. We clean all our gown on location. You can see your gown before the preservation is done. Your gown will be cleaned by the only dry cleaner licensed in the State of Nevada to use the Museum Care Method ™ of cleaning. This is the method that is recommended by top designers.